We are leading manufactures of Marine Aluminium Cooler Body . And also we can provide customer sizes of Castings. Window Cooler made of G I Sheet available in 12", 15", 18" sizes. Available with or without motor. We are offering FRP Cooler Body to our clients. Being a quality conscious firm, we are offering Fiber Cooler Bodies. The Fiber Cooler Body we offer is widely demanded amongst the clients for its durability and reliability. Offered products are made by using quality material, which is sourced leading vendor of the industry. Surjit Moulds & Tools Pvt. 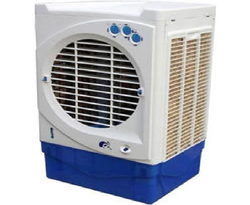 Ltd.
White Fiber Cooler Body 12"
We have carved a niche amongst the most trusted names in this business, engaged in offering a comprehensive range of Plastic Cooler Body. Cooler Body Capacity: Water 65 Ltr.